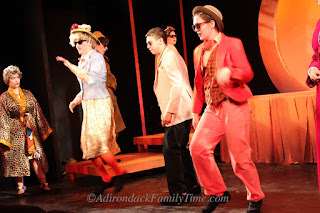 (Saranac Lake) Magical things are happening at Camp Pendragon Theatre! Wonderful, mystical things that will pull you right into a fun-filled world where insects talk, peaches are houses, and evil aunties get their just rewards in the end. 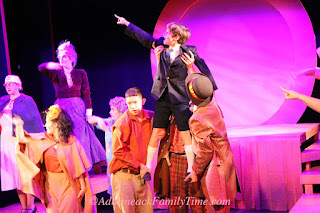 This year's production of Roald Dahl's James and the Giant Peach had us laughing and clapping, and wanting to be adopted by a spider, a grasshopper, and a ladybug. I'll admit that I've only read Roald Dahl's book, James and the Giant Peach. I've never seen the movie or the musical. How does one make a giant peach with human-sized insects come alive on stage and be funny, warm and loving? 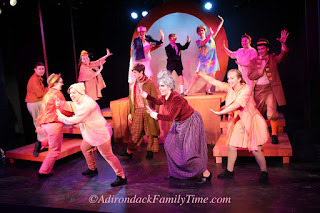 Come see this year's performance of Camp Pendragon Theatre's Roald Dahl's James and the Giant Peach and you'll find out. Director Matthew Sorensen shares with us an imaginative world where adventure is just a wish away. This production is rich with talent from incredible vocals and dance numbers to gorgeous costumes and full-size puppets*. The cast ranges in ages from 7th grade to rising college freshmen.This isn't just a children's performance; it's a witty romp for all ages. 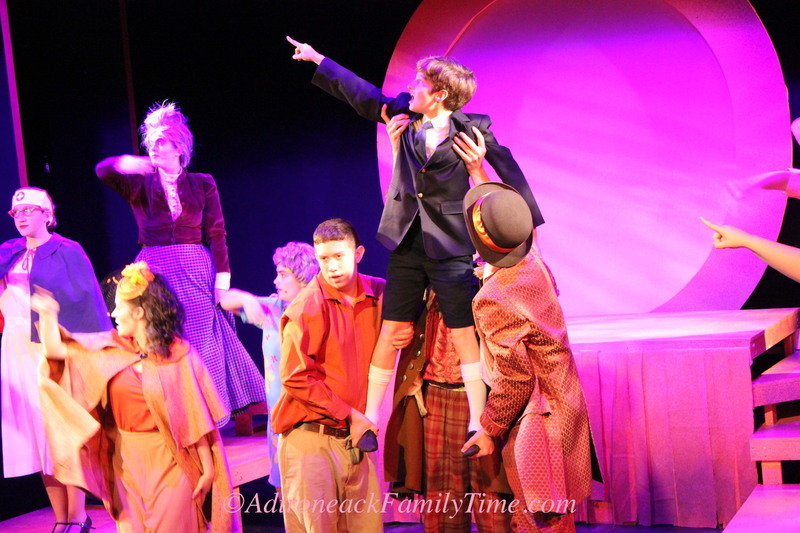 Director Matthew Sorensen and Assistant Director Annachristi Cordes have managed to pull a powerful performance from each actor as they journey from an English orphanage to an ocean crossing in a giant peach. 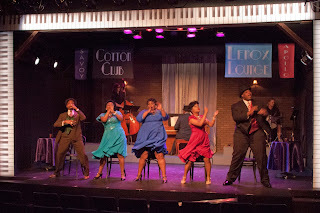 Musical Director Elizabeth Cordes has fine-tuned these musical numbers to a professional level while the simple setting enables actors to fill the stage with creative dance numbers choreographed by Terpsie Toon. 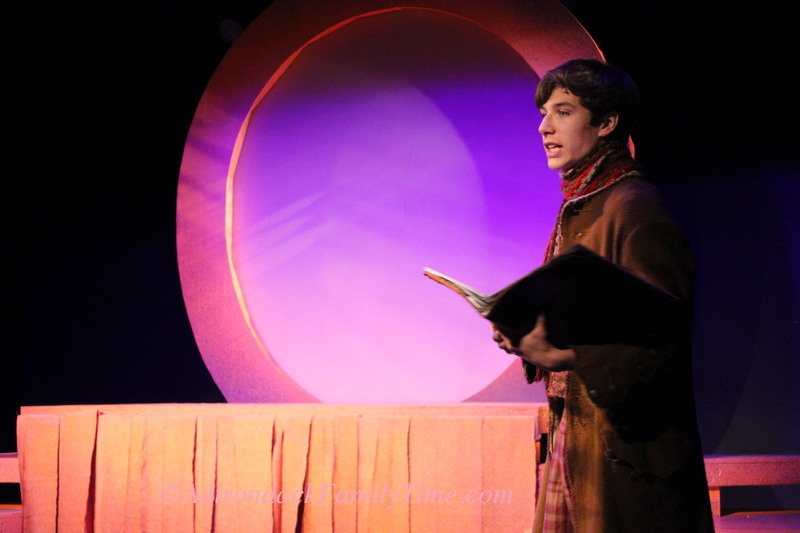 James (Andrew Scanio) is small and innocent, befriending a grasshopper (Noah Cordes) and a ladybug (Kirsten Denis) while in the English orphanage. Creative rod puppets flitter around the stage. Shade puppets (Shane McNeal) and masterful lighting by Kent Barrett create a mystical atmosphere as James struggles to conquer his nightmares about losing his parents. James is shipped off to his only living relatives Aunt Spiker and Aunt Sponge, a pair of conniving, pickpocketing scam artists waiting for their next mark. 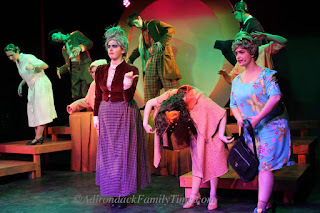 Aunt Spiker (Sarah Dalton) and Aunt Sponge (Kendall Davison) are hilarious. Their cockney accents and costumes add just a touch of evil to their dodgy ways. They are a perfect villainous team exploiting James and anyone else unfortunate to get in their path. Jameson Batt as the Ladahlord/Narrator adds the perfect amount of levity throughout the performance. He pulls us into the pages of the book with a wink and smile while belting out some great tunes. James meets the Ladahlord and is given a magic potion to help him escape his awful auntie situation. He spills the potion creating a giant peach. After the evil aunties turn the fruit into a sideshow, James discovers a door inside the peach. He enters an imaginative world where insects share their feelings and protect each other despite their differences. The costumes throughout the production are gorgeous. Annachristi Cordes and Sasha Van Cott have created peach-hued, multi-patterned pieces that easily allow the actors to change between multiple characters. Marvelous and amazing things await the fearless James inside the peach. Human-sized puppets take the stage. I can't choose a favorite. The genteelly-bred Ladybug (Kirsten Denis) soothes James while Spider (Lexi Valentin) nurtures him. 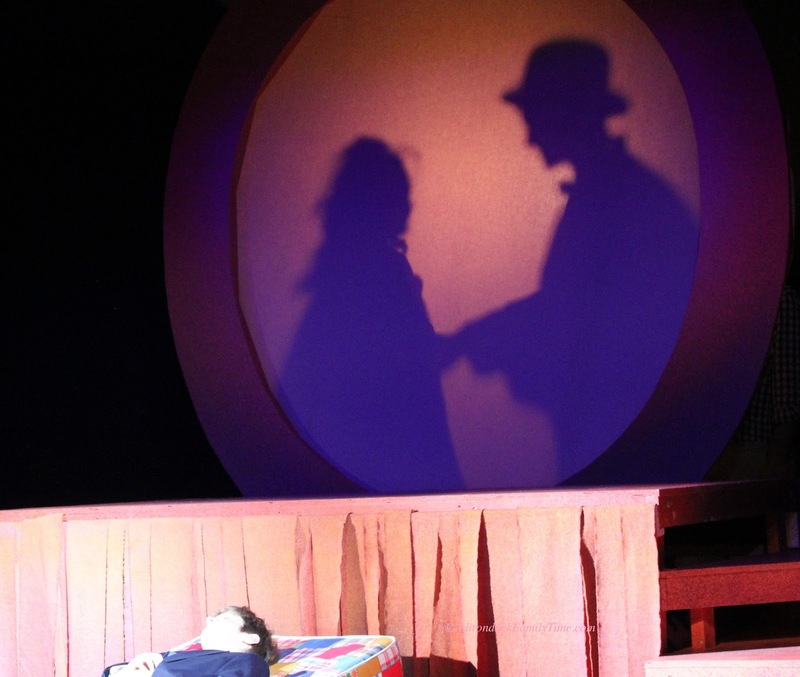 Grasshopper (Noah Cordes) is the adventurer while Earthworm (Mitchelle Jensen) quakes with fear. Natalie Orman's Centipede is unforgiving to all humans. The puppets are wonderful, allowing each actor to draw the audience into this imaginary world. Don't wait for a rainy day to see this production. It's only here for a short time. There are plenty of one-liners and wonderful songs that will have you laughing and humming along. Let yourself go and stumble into a world where grasshoppers tap-dance and family is what you create. Enjoy! *I was asked not to post photos of any of the puppets. You will have to go see them for yourselves. You will be glad you did.